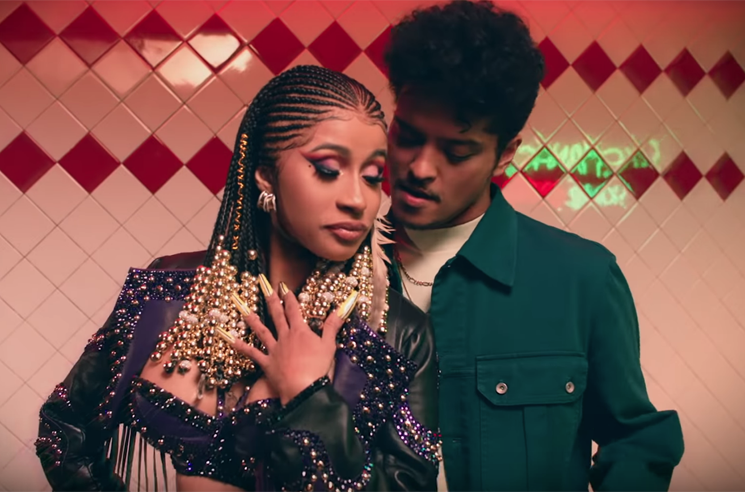 "Finesse" friends Cardi B and Bruno Mars recently reunited for "Please Me," and now the sensual-sounding song has been given an equally steamy video. The clip is set in Los Angeles, and it sees Mars and his boys at a taco joint, soon followed by Cardi and her girls. From that point on, the checkerboard linoleum floor transforms into a dance floor. There's grinding up against the counter, twerking on tabletops and Cardi straddles the soda machine. It probably wouldn't pass a health inspection, but it's still fun to watch. The raunchy flirting continues when they leave the restaurant, with Cardi and Mars making at eyes at each other out the sunroofs of their respective groups' cars. Check out the video for "Please Me" below. ​Bruno Mars Begs for Cardi B on New Single "Please Me"